Iconic "Opium" box bag with silk cord shoulder strap and tassel detailing by Yves Saint Laurent from the 1980s. 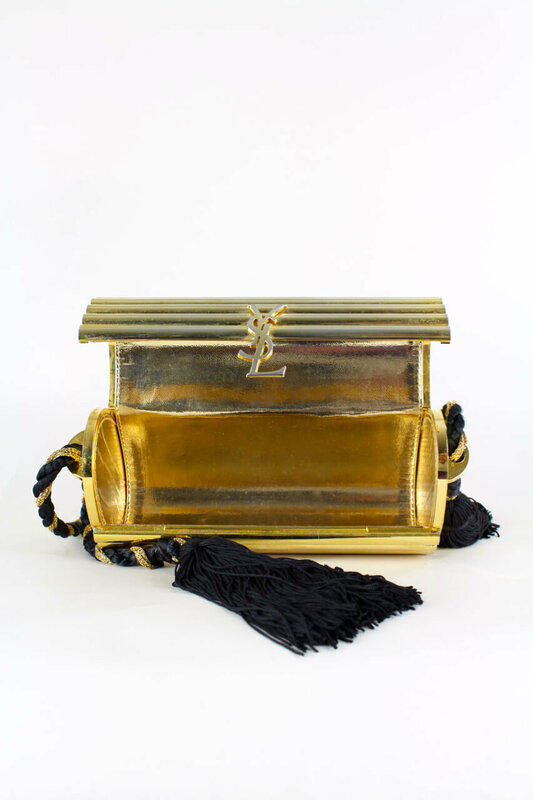 This 1980s YSL minaudière box bag features a rigid cylindric exterior sculpted from a shiny ribbed gold-tone metal with interlocking YSL initials at the center and a long black and gold braided silk cord shoulder strap finished with black silk tassels. 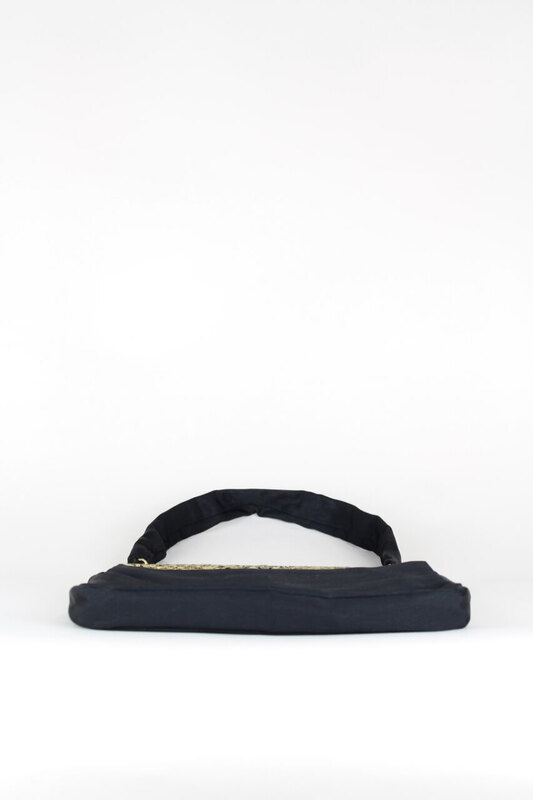 The length of the strap allows the bag to be worn by hand (see last picture), shoulder or across the body. 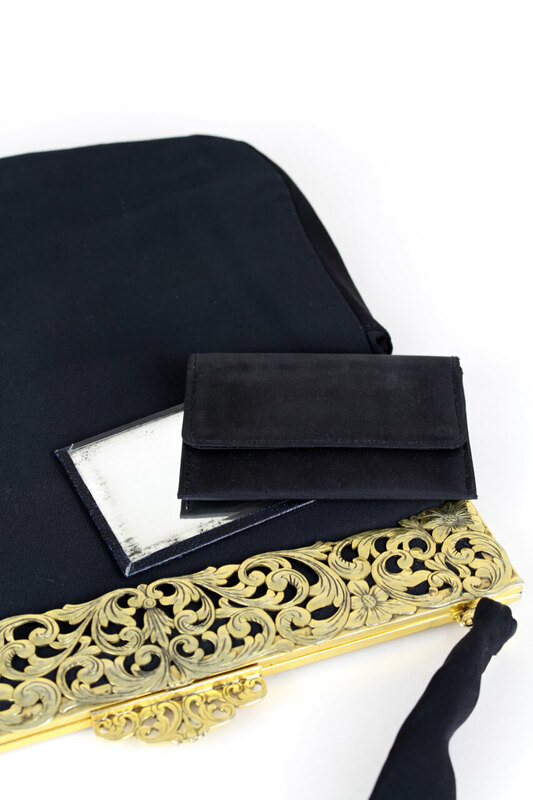 It closes with a seamless flap closure and is lined in gold leather. 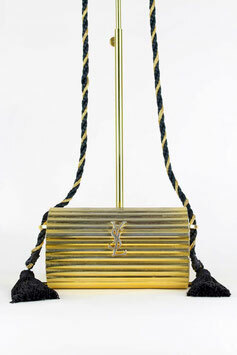 Yves Saint Laurent was born in 1936 in Oran, Algeria and began his career as an assistant of Christian Dior. When Dior died in 1957, he became the artistic director. 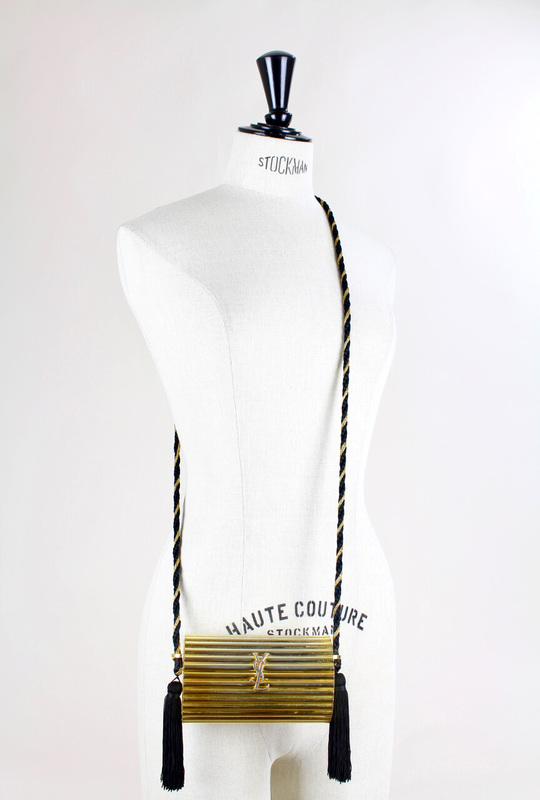 In 1962 Saint Laurent opened his own fashion house, and in 1966, he created his ready-to-wear line "Rive Gauche". 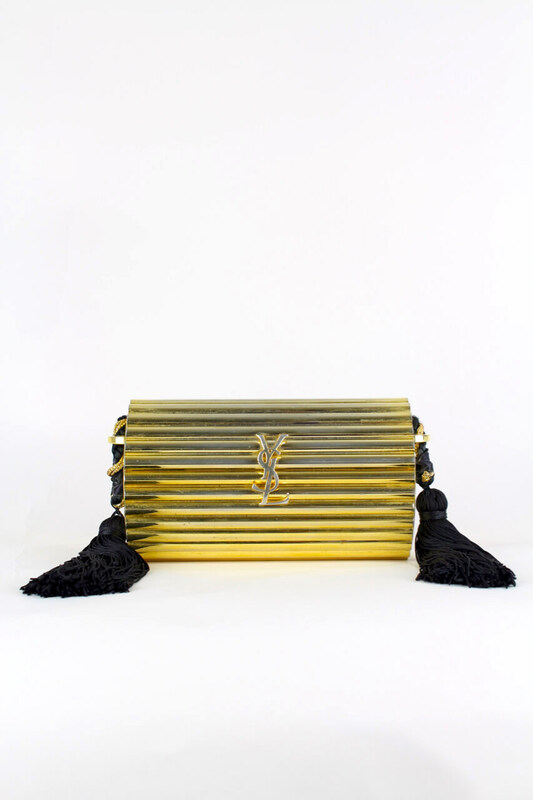 The more affordable prêt-à-porter line "Saint Laurent Variation" was launched in 1983. 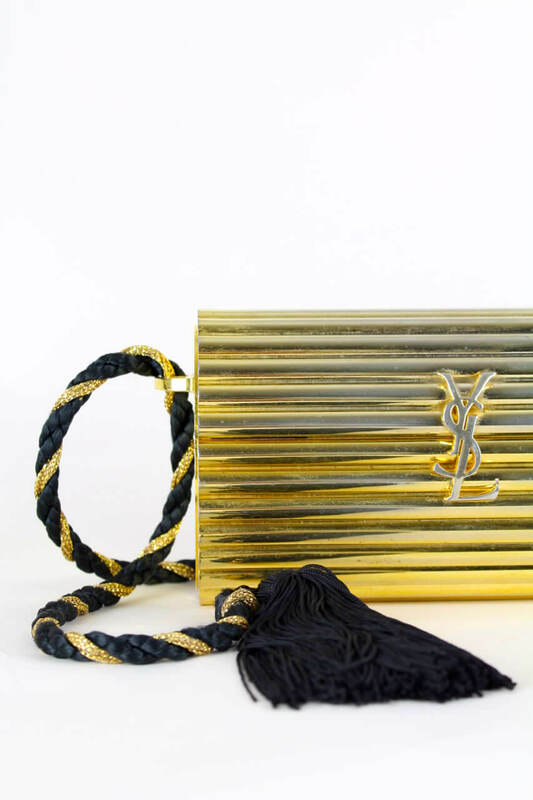 At this time, Yves Saint Laurent was a true icon. 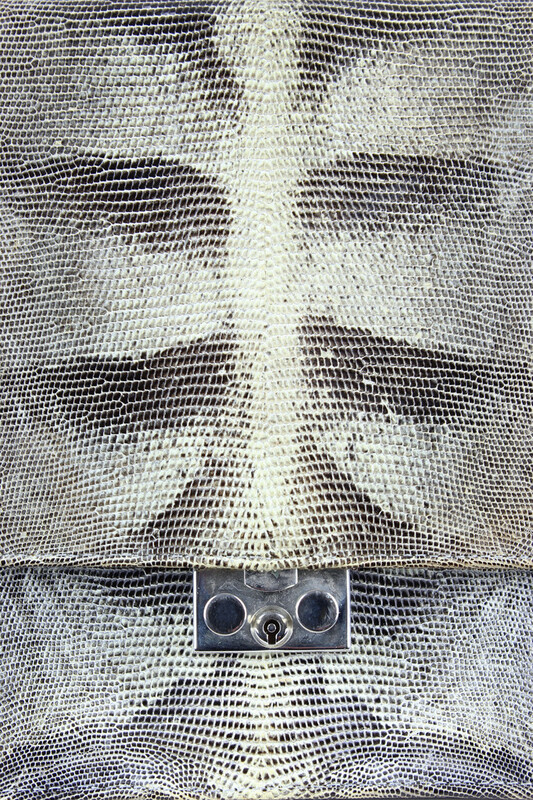 He was the first living designer to receive a solo exhibition in New York's Metropolitan Museum of Art in 1983. He died in 2008. 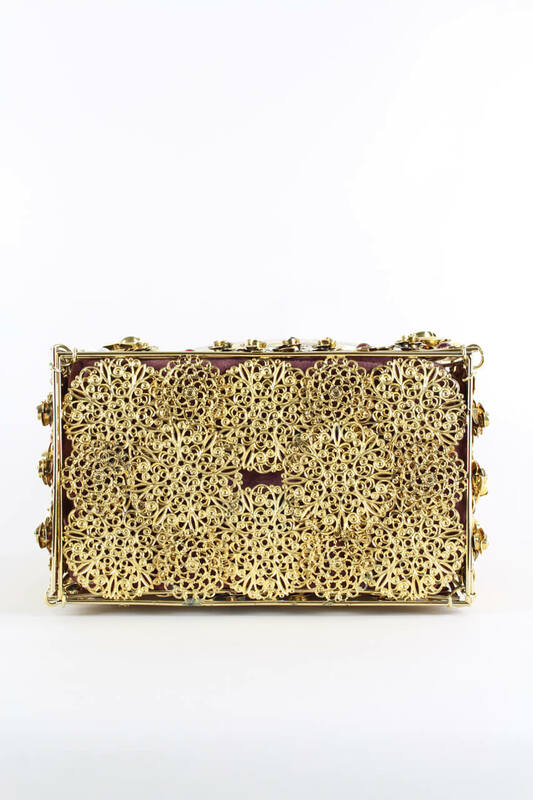 This bag is in very good vintage condition with light wear: Minor fading of the gold metal. Usual scratches/scuffs throughout and few oxidation spots. Nothing that really detracts. The inside of the bag is clean and pristine. 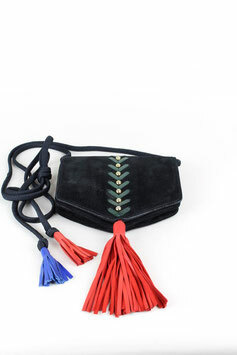 The shoulder strap and tassels are full and in beautiful condition. Closure works flawlessly. 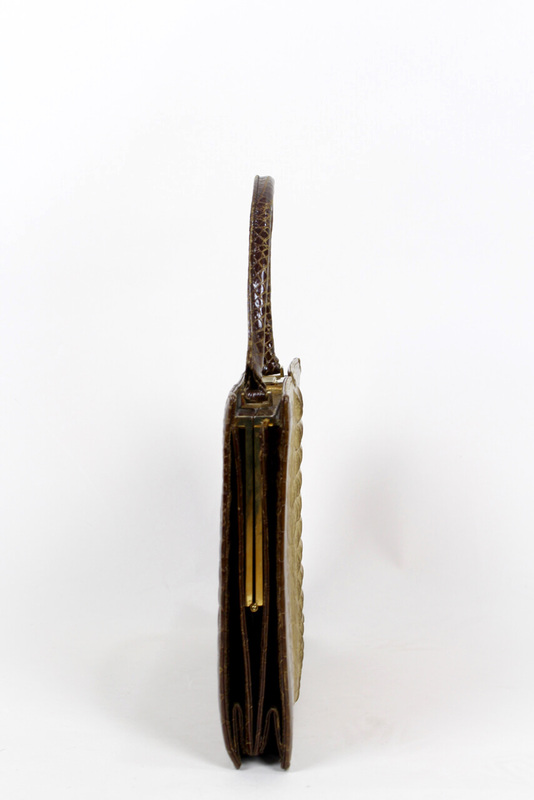 Length: 14,5 cm – 5.7"
Height: 9 cm – 3.5"
Depth: 6,5 cm – 2.6"
Reference photos: Kim Kardashian sporting her vintage YSL Minaudière at LAX Airport (April 29, 2014). Vogue editorial. 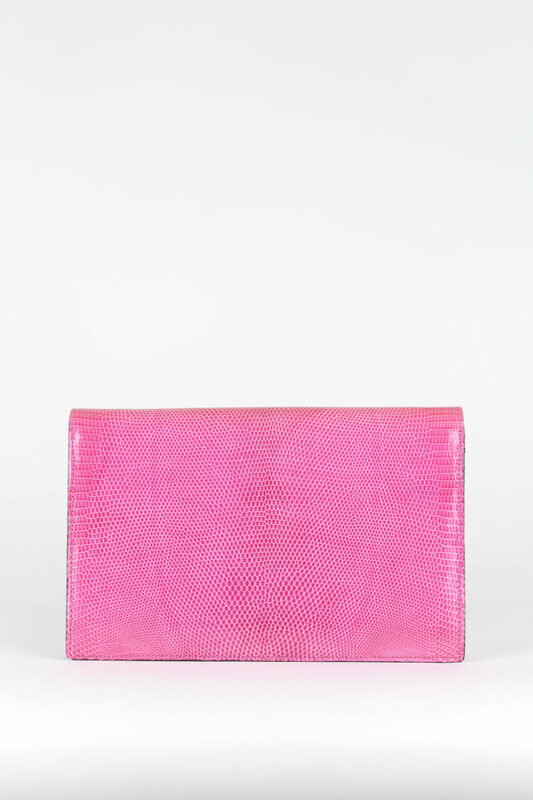 Chic Roberta di Camerino velvet and canvas clutch bag from the 1970s. 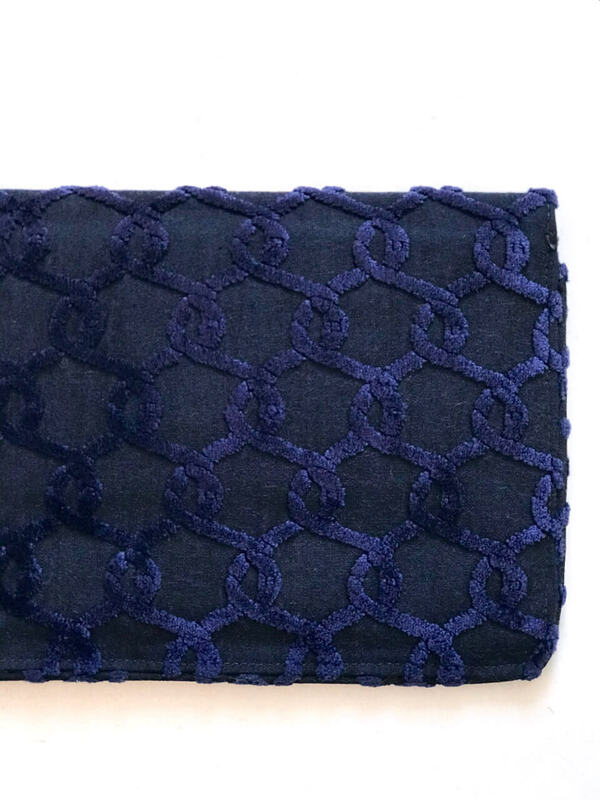 This blue 1970s Roberta di Camerino slim envelope clutch bag or pochette features the signature Roberta di Camerino intertwining belts design in a raised gentian blue velvet on a darker navy blue canvas giving it a beautiful 3D effect. 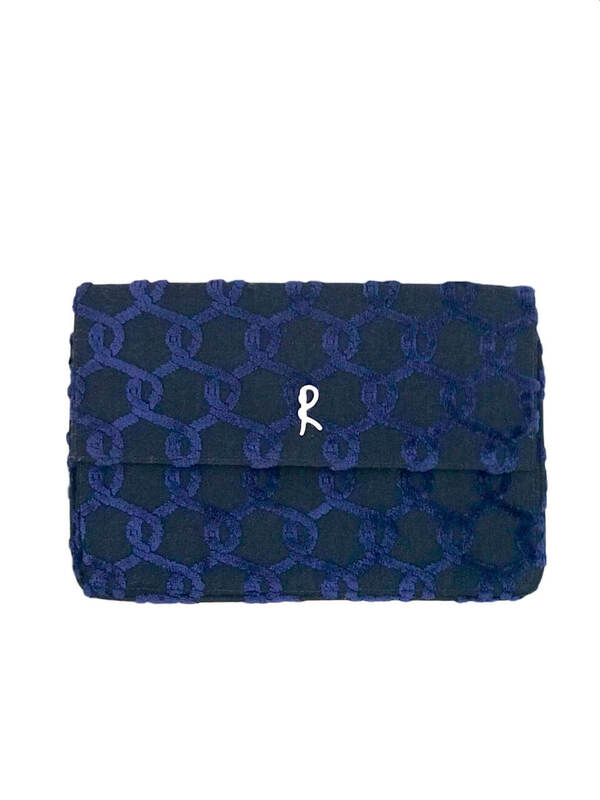 It is detailed with Roberta di Camerino's signature initial emblem and closes with a press button. 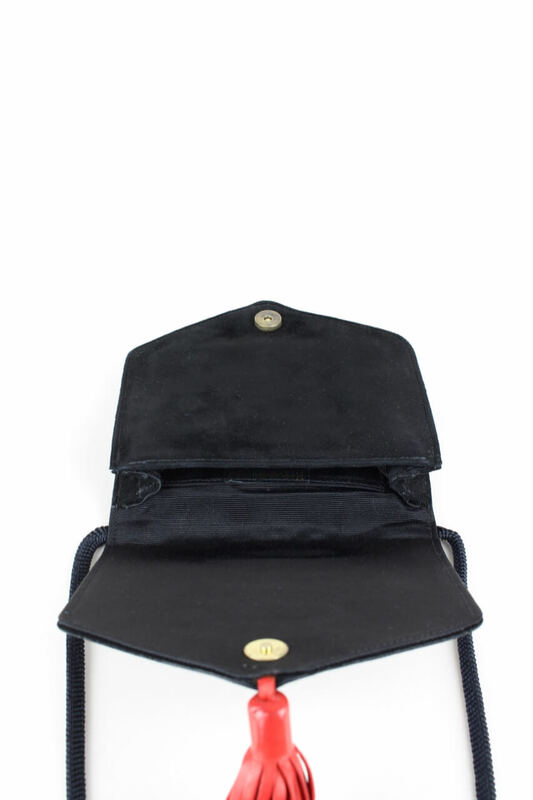 The interior is lined in black leather and shows one small flat slit pocket. 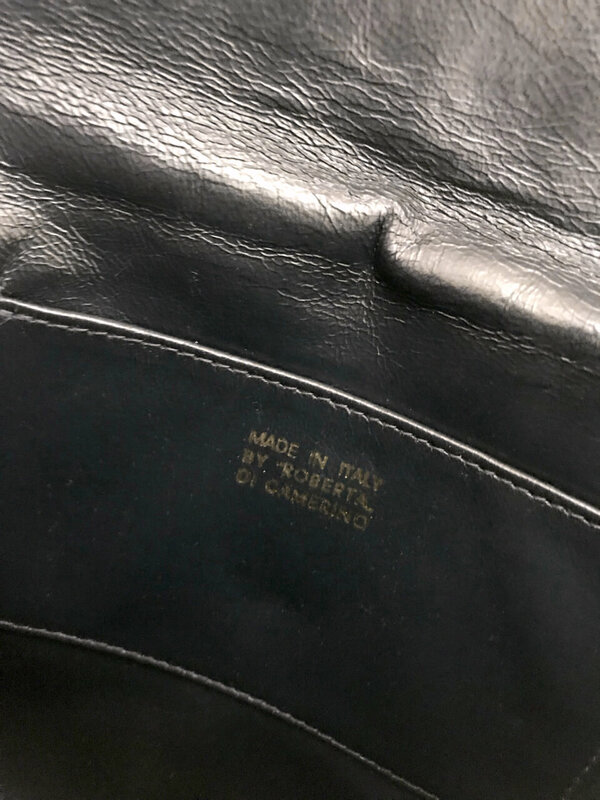 On the inside of the bag the words imprinted in gold read "Made in Italy by "Roberta" di Camerino". PLEASE NOTE: Depending on the light conditions the colour appears brighter or darker and the 3D effect stronger or less strong. 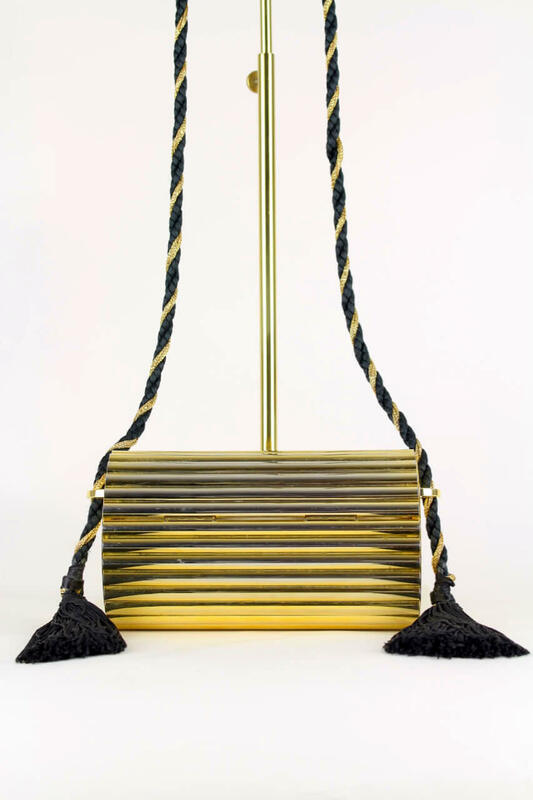 The house of Roberta di Camerino was founded by Giuliana Coen Camerino (1920-2002) in 1945 in Venice, Italy. The company's name is a combination of the name Roberta, taken from Giuliana Camerino's favourite song "Smoke gets in your eyes" and Camerino, her husband's surname. 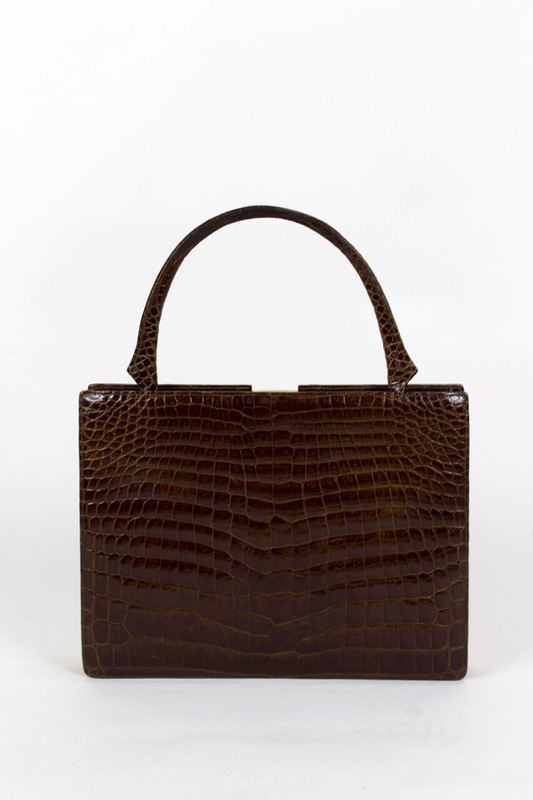 Giuliana Camerino was one of the first designers who created the idea of an easily recognizable status handbag. 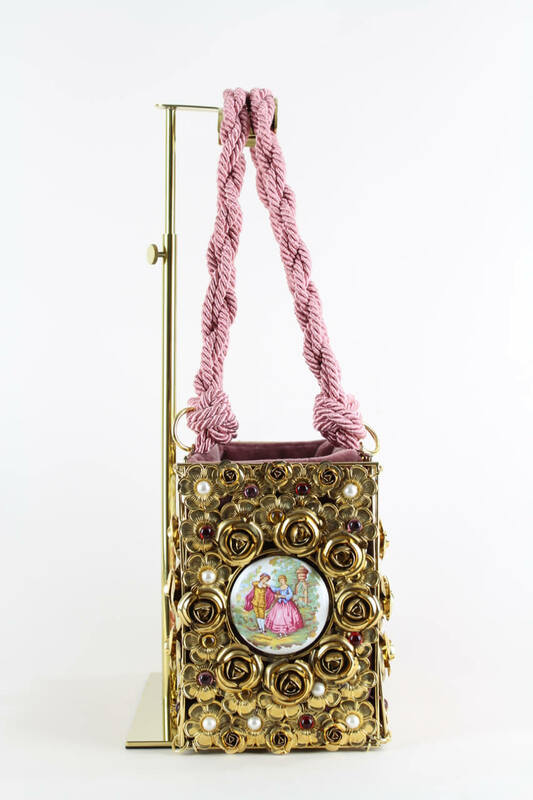 The neo-baroque style bags were produced of "Soprarizzo" velvet – originally used for furnishings – in the most beautiful and unusual colour combinations and clasps and studs created by the craftsmen of brass ornaments for gondolas. 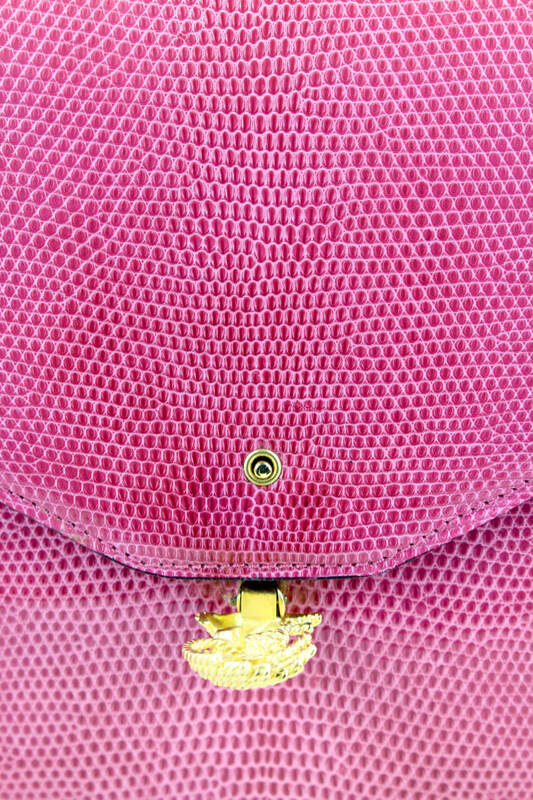 The result were truly revolutionary and unique bags. 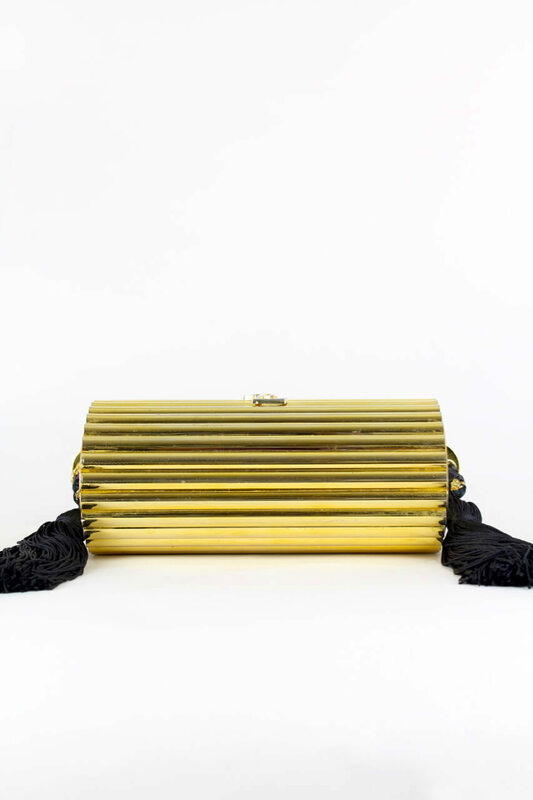 Already in 1956 Giuliana received the prestigious Neiman Marcus "Oscar of Fashion" Award. 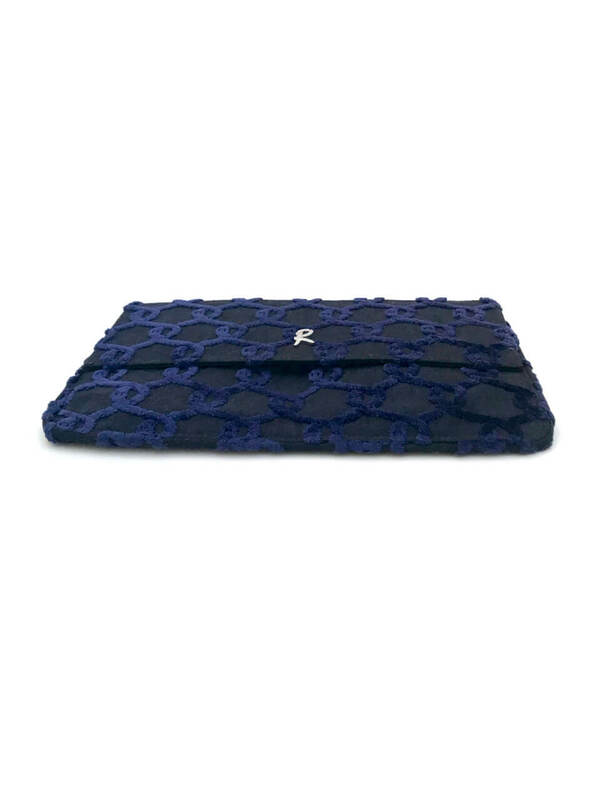 Her creations were loved by celebrities and royals all over the world, such as Grace Kelly, Elsa Maxwell, Princess Paola of Liegi and Isabella Rossellini. Excellent vintage condition. Very clean interior. 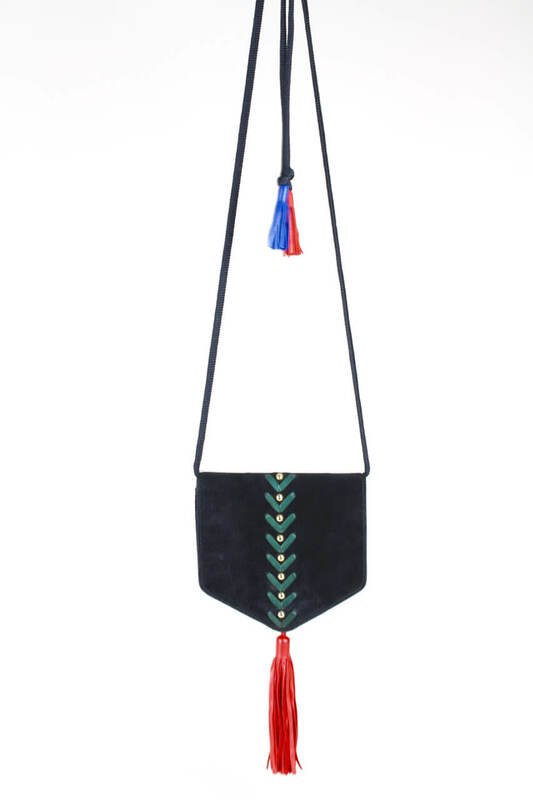 Height: 16 cm – 6.3"
Width: 23,5 cm – 9.3"
Collectible Yves Saint Laurent black suede tassel bag from the 1980s. This adorable, rare pentagonal shoulder bag is made from soft black suede featuring a racing green leather stitchery with gold-tone studs and an oversized ultra-supple leather tassel in bright red on the pointed flap. 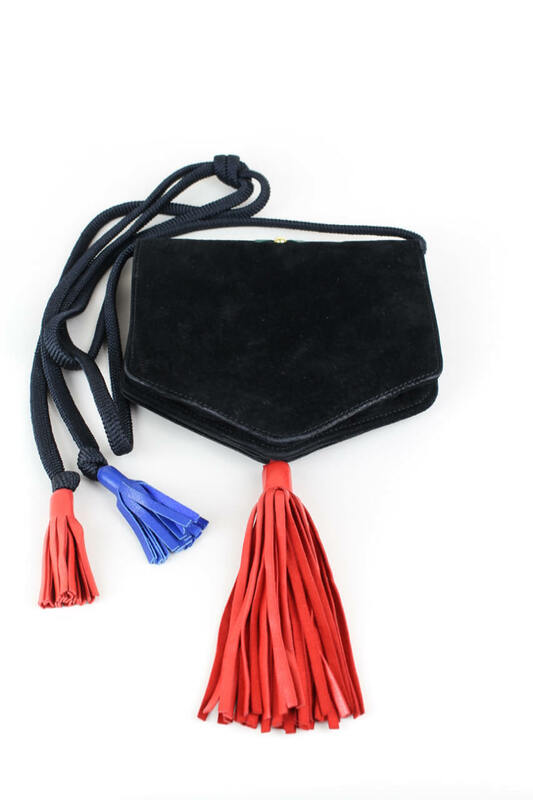 The adjustable long braided silk rope strap is knotted together before ending in a pair of smaller beautifully soft leather tassels in cherry red and ultramarine blue. 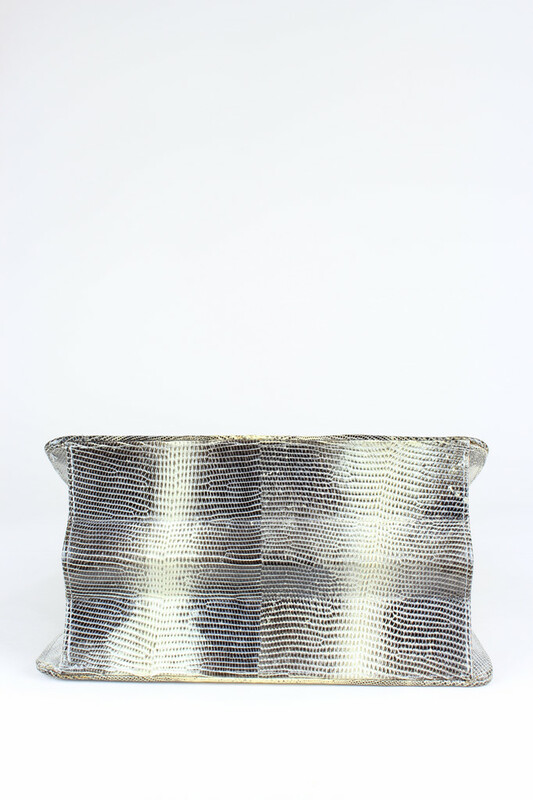 The interior is lined in black grosgrain fabric with one side pocket. 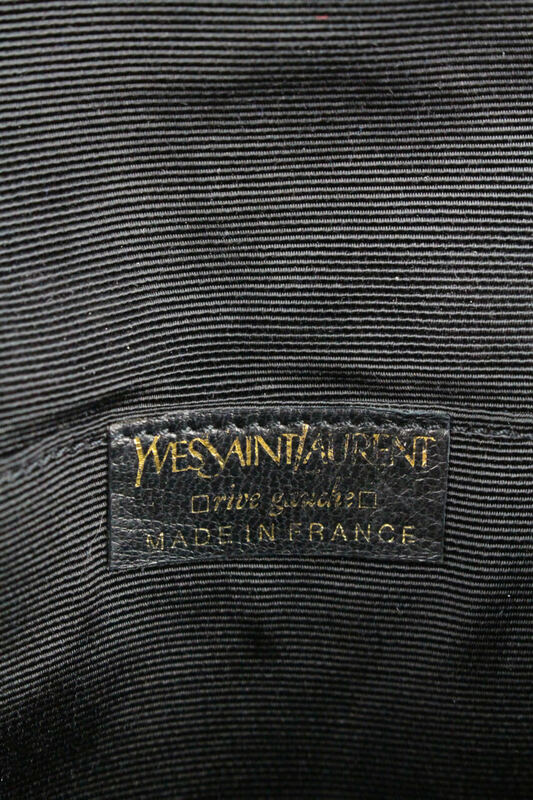 The bag has a magnetic fastening and is stamped "Yves Saint Laurent rive gauche, Made in France" inside the bag on the pocket. 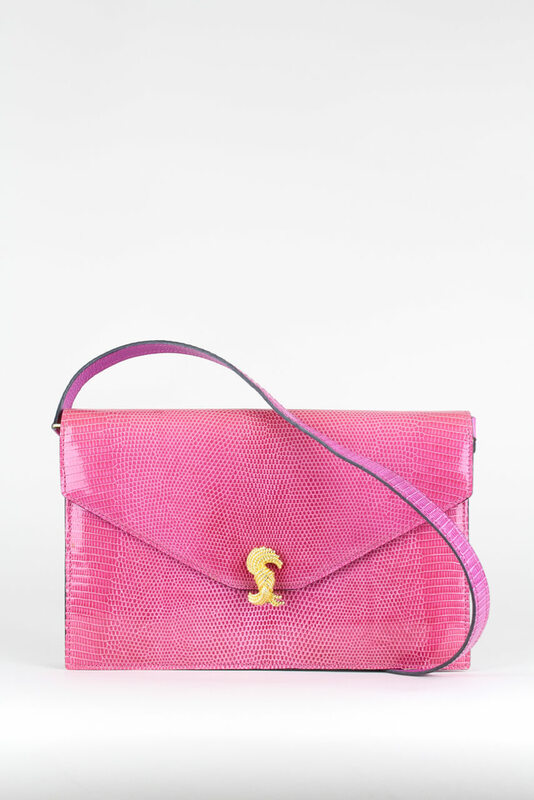 It has the added provenance of coming directly from a lady that worked for the YSL shop in Munich so has not been on the market prior to this. 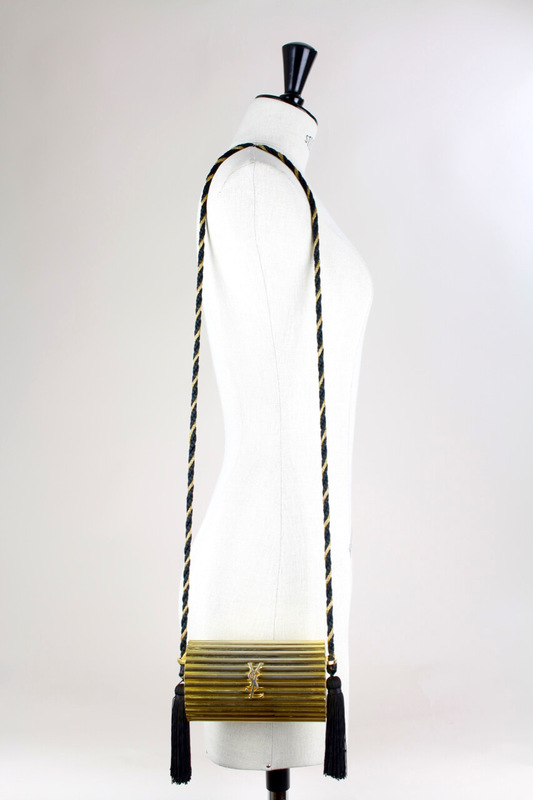 The bag can be worn cross-body as well. 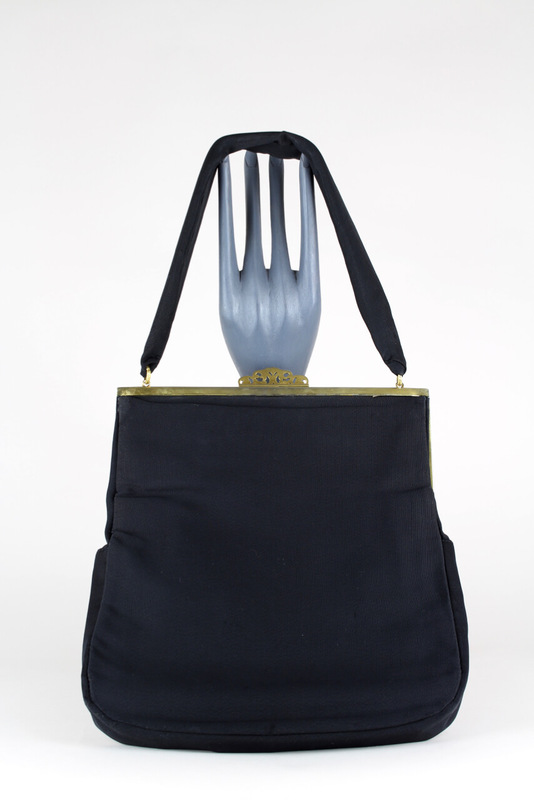 This bag is in excellent vintage condition. Seems unworn. 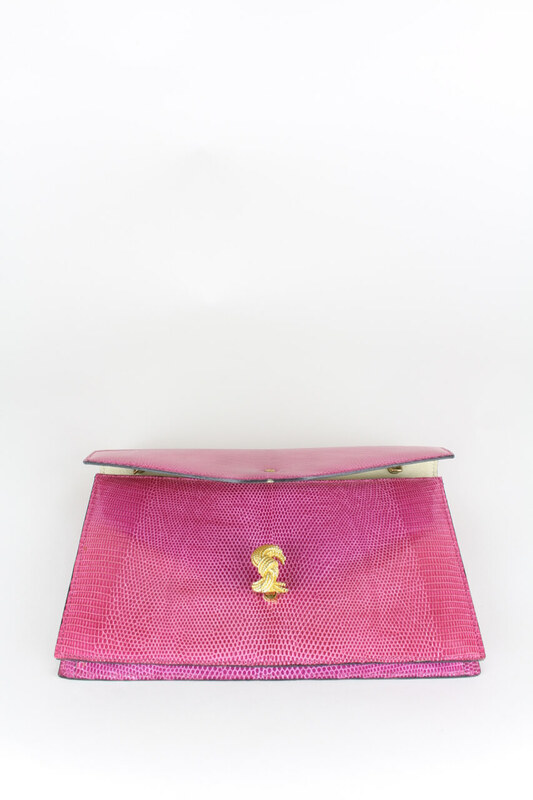 Width: 15 cm – 5.9"
Depth: 3 cm – 1.2"
A true vintage Couture gem of a handbag by Dolce & Gabbana from the late 1980s/early 1990s. 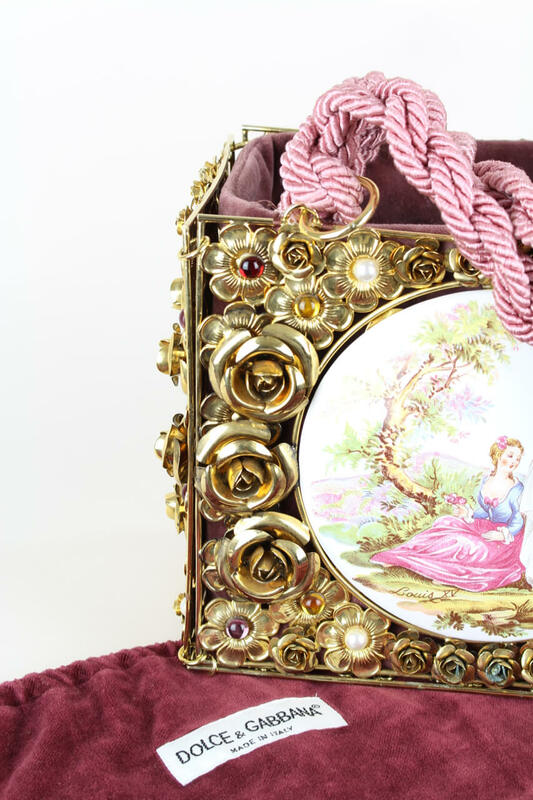 Early pieces by Dolce & Gabbana are very rare and hard to come by. 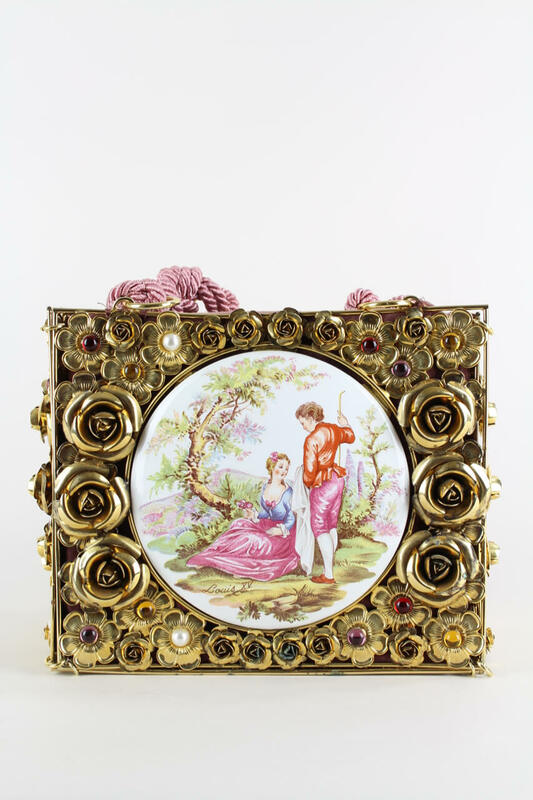 This treasure, like several others that will be listed gradually comes direct from a German socialite and fashion collector so has not been on the market prior to this. 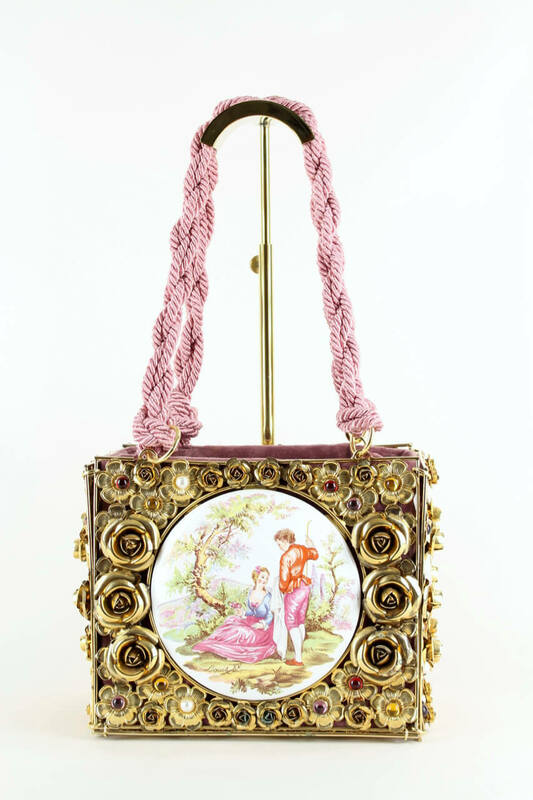 The bag is an exquisite one-of-a-kind Dolce & Gabbana Couture rococo-inspired top handle version from the late 1980s/early 1990s. 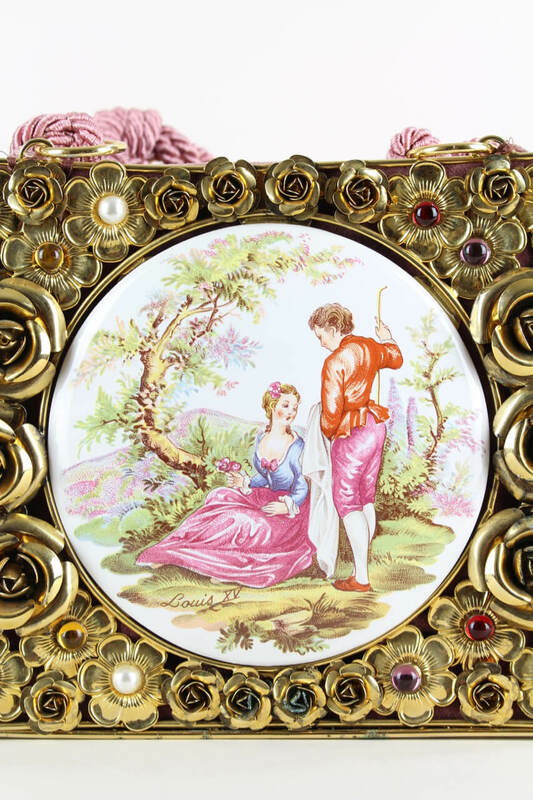 Intricately crafted in metal with an old golden finish, this opulent piece is richly embellished with 3D floral ornaments and porcelain medallions on every side featuring two different Francois Boucher-esque pastorals. 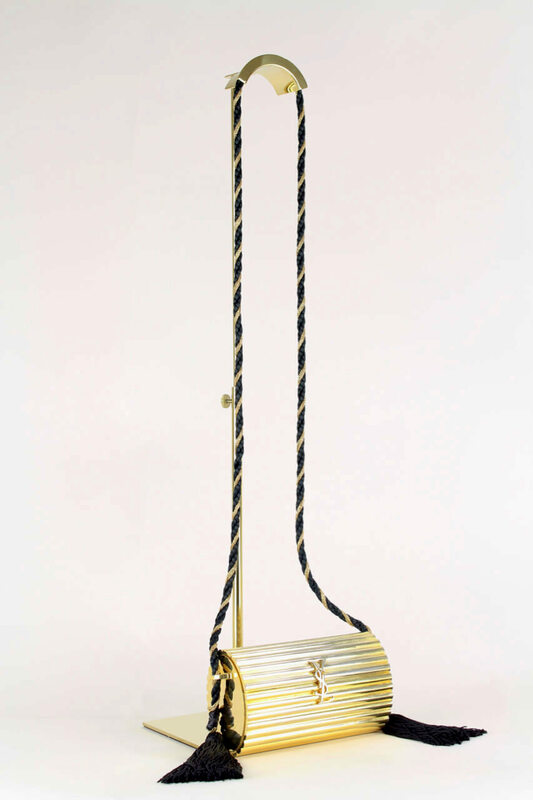 The four side panels are connected to each other and to the base panel with small metal rings. 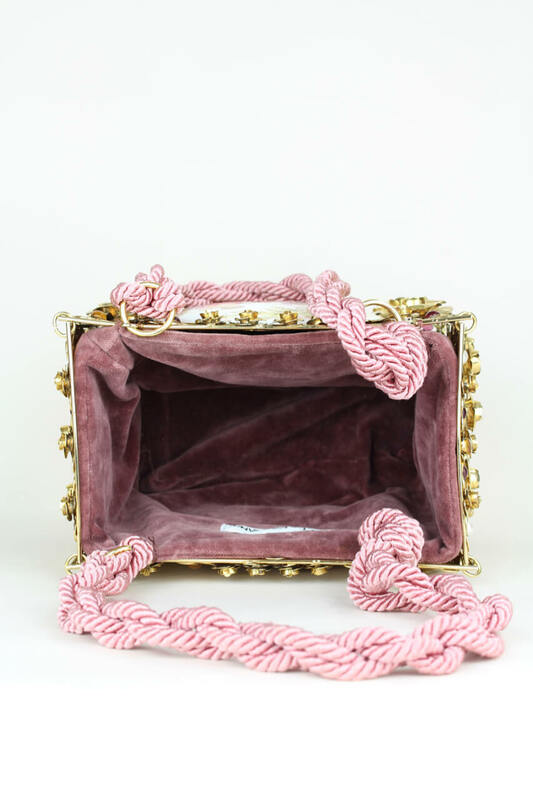 This collectible open top show piece is lined in dusky pink velvet and has twisted top handles made from a light pink silk cord. 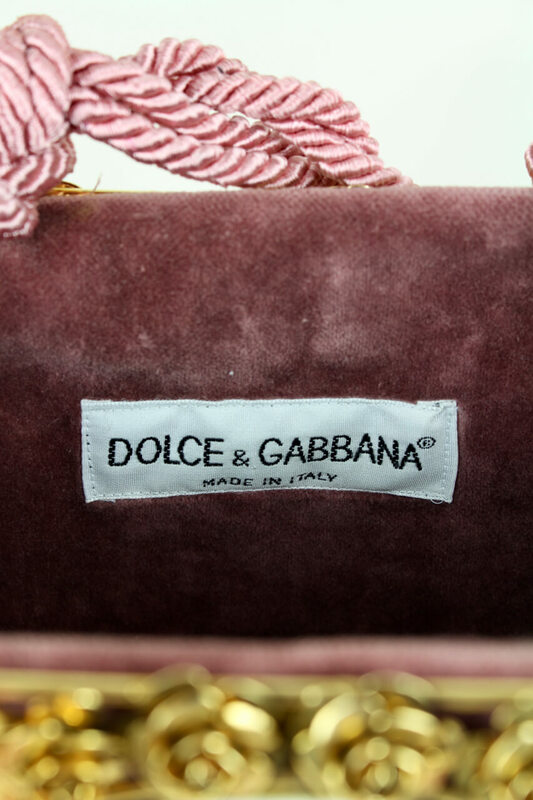 It is labeled “DOLCE & GABBANA MADE IN ITALY“ and comes with its original burgundy velvet dust bag that is labeled on both sides as well. 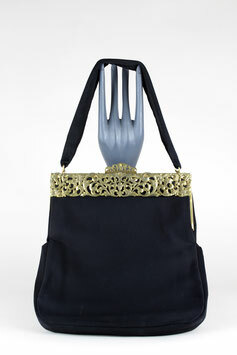 This bag is in excellent vintage condition. Unworn. Extremely minor pin-top size patina spots to the metal from storage. Almost too minor to be mentioned but provided for accuracy. 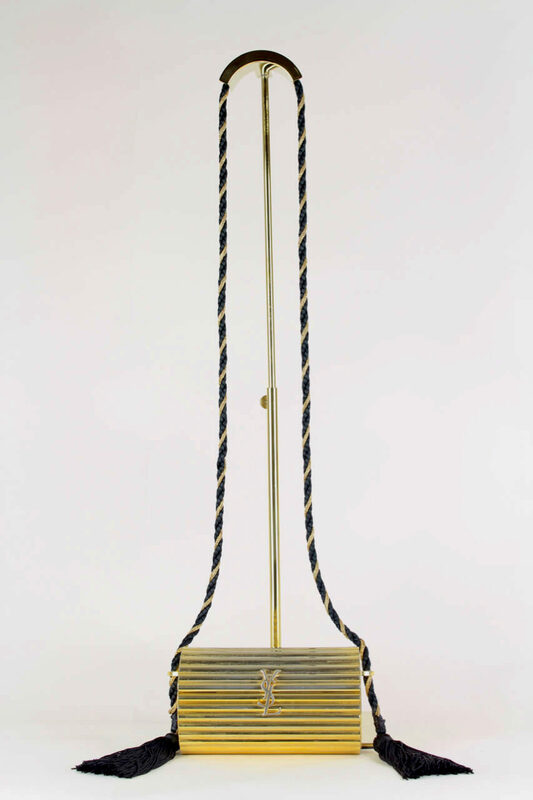 Original price almost 30 years ago: Circa Deutsche Mark 7,000 which corresponds to EUR 14,000. 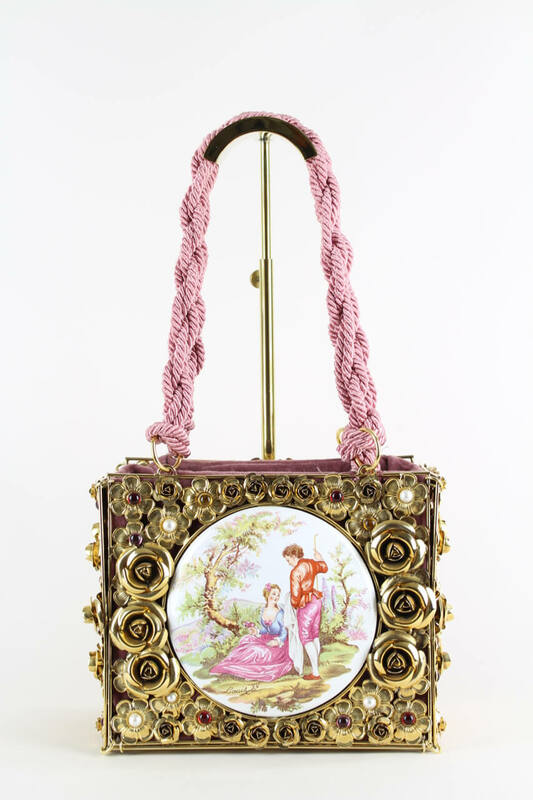 Height: 16,5 cm – 6.5"
Handle: 22 cm – 8.7"
Width: 19,5 cm – 7.7"
Depth: 11,5 cm – 4.5"
Ravishing Art Nouveau black fabric floral gold frame handbag from the early 20th century. 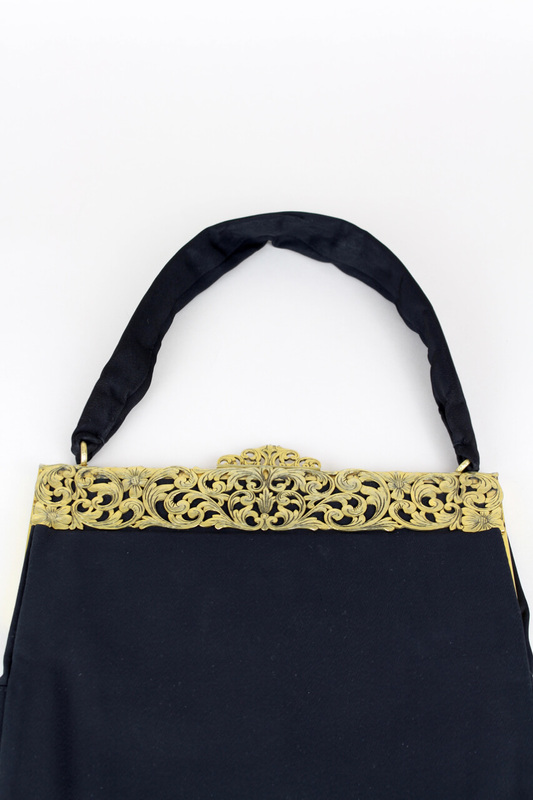 This Art Nouveau handbag is made from high-quality heavy black fabric and features a gold-tone metal frame richly decorated with beautiful cut-out flowers and leaves, a snap closure and a single handle in matching fabric. 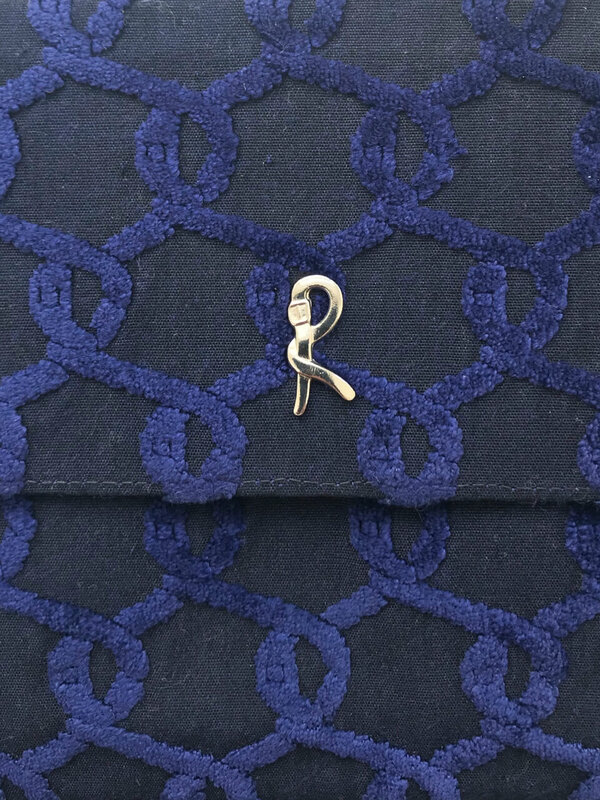 The handle is of good length, long enough for elbow wearing. 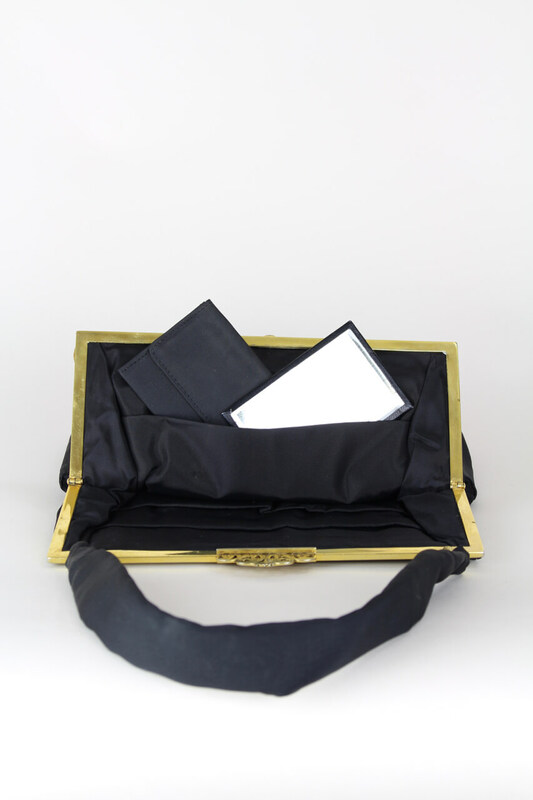 The interior is lined in black taffeta and features two large pockets on each side and additionally two smaller pockets on one side. 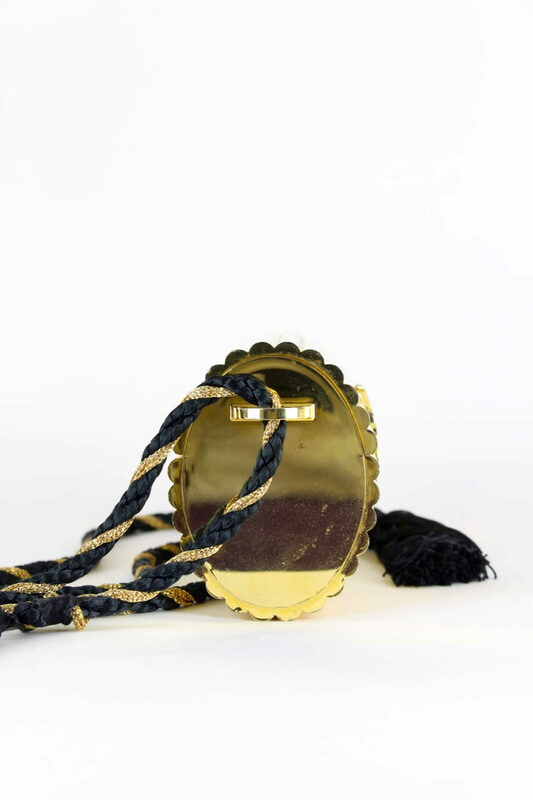 The bag comes with the original small fabric coin purse and cloth-backed mirror that fit neatly into the small pockets. 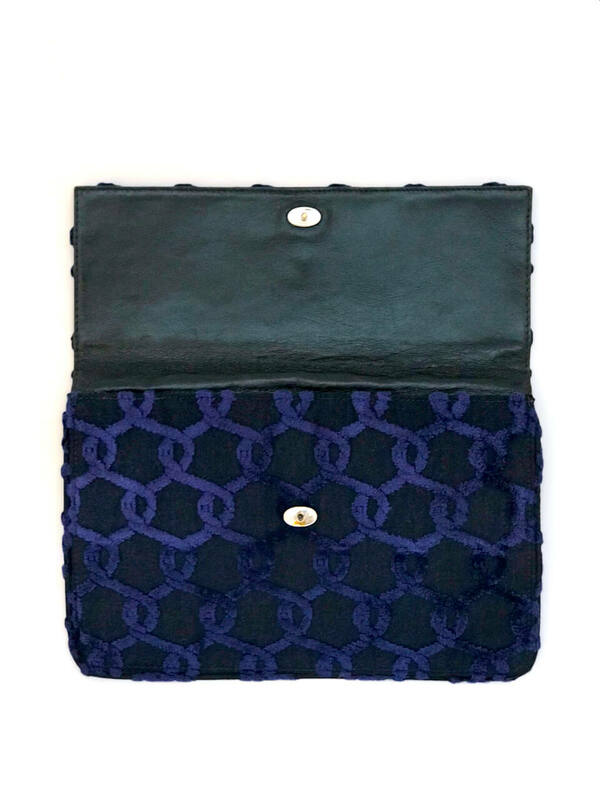 The bag comfortably fits a large smart phone with room to spare. 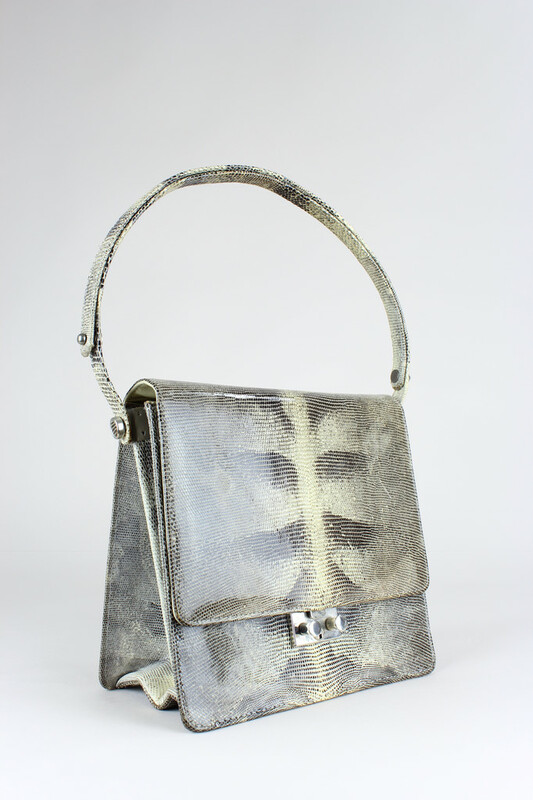 This bag is in excellent vintage condition. Appears to have been worn very little. 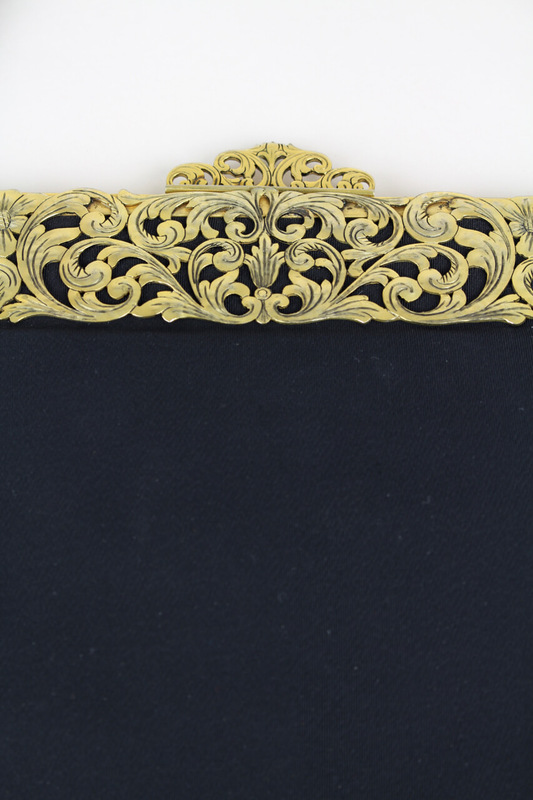 The metal frame and the mirror show extremely slight signs of wear. The lining is fully intact and looks like new. Hinge and closure work perfectly. 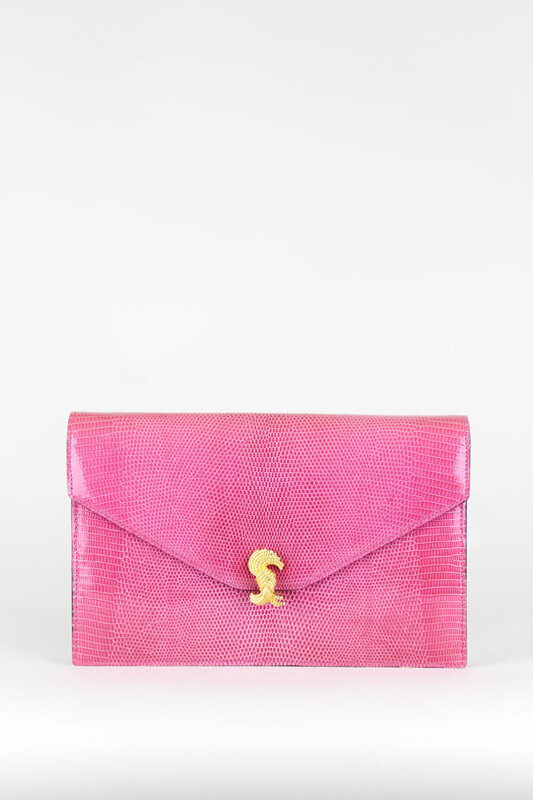 Width: 22 cm – 8.7"
Depth: 2,5 cm – 1"
Luxurious vibrant pink lizard skin bag by Asprey of London probably from the 1990s. 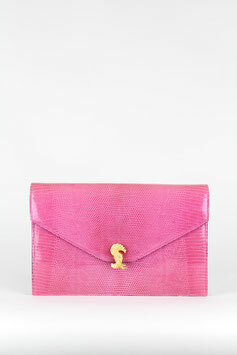 This envelope style clutch bag or shoulder bag is made from pink-hued carefully matched strong exotic lizard skins. 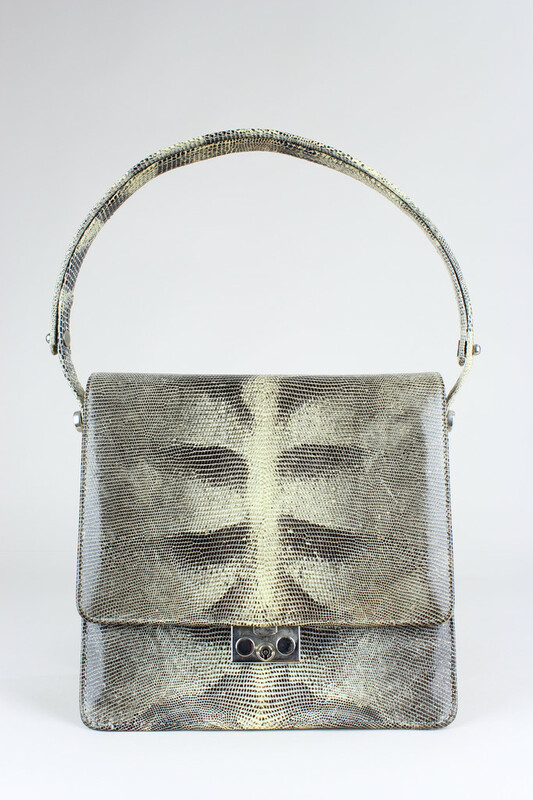 It features a front flap with a gold-tone clasp closure designed like a bunch of knotted cords and a detachable shoulder strap in matching lizard skin. 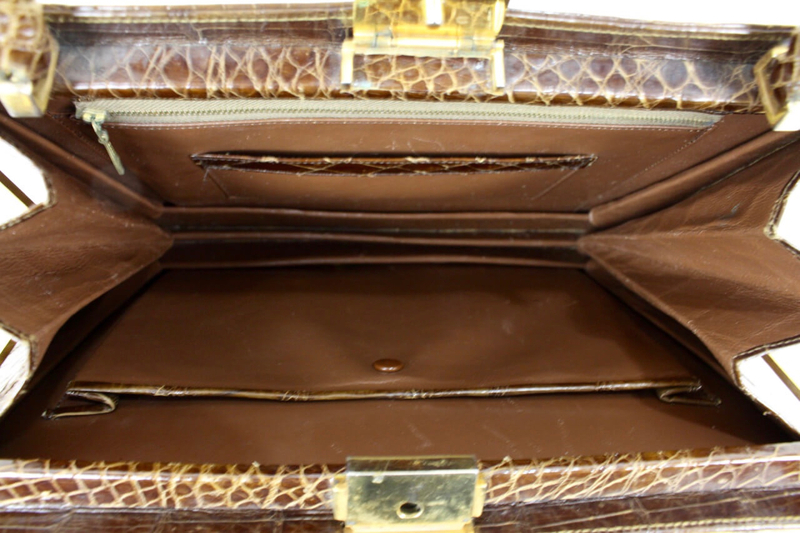 The soft beige smooth leather interior has one zippered pocket and is marked "Asprey, Made in France." 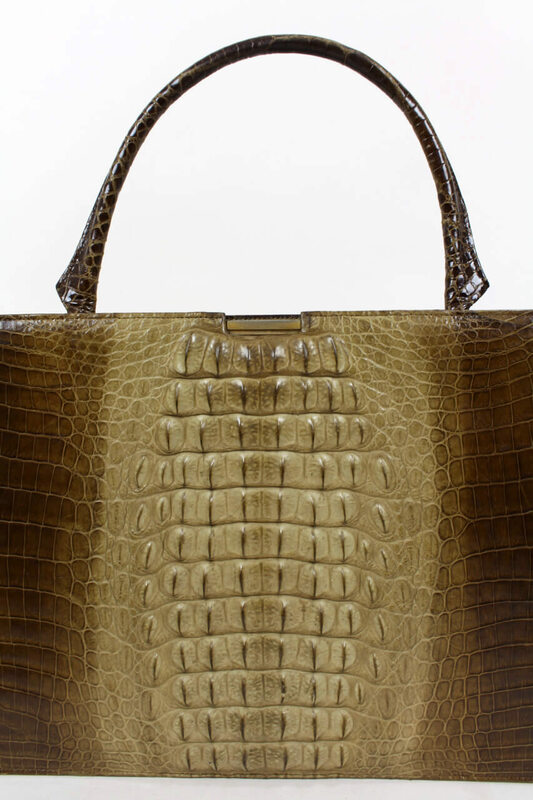 Asprey, founded in London, United Kingdom, in 1781 by William Asprey advertised "articles of exclusive design and high quality". 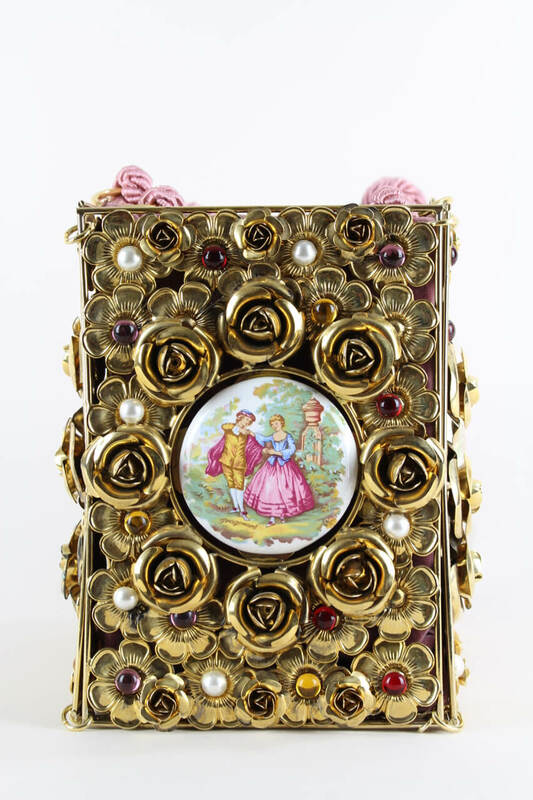 An early speciality was dressing cases, for which Queen Victoria awarded Asprey a Royal Warrant for in 1862. 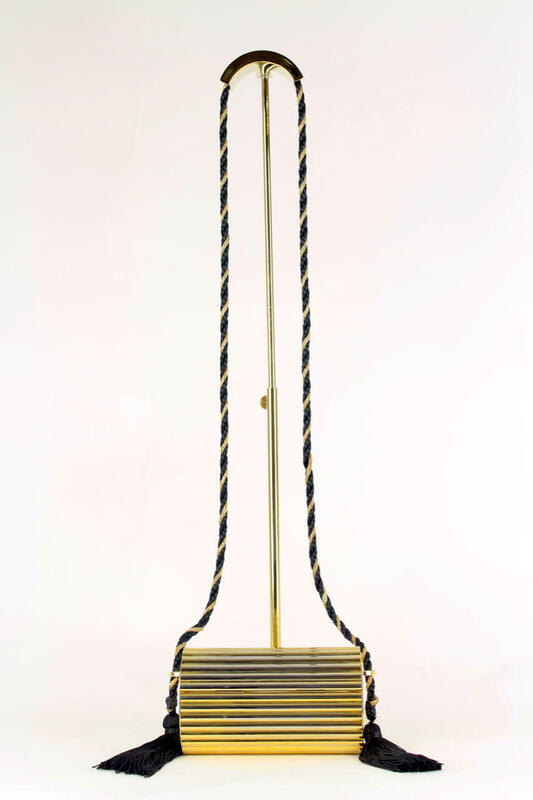 Ever since Asprey has continuously defined British luxury on the basis of its core values of quality, refinement and innovation. 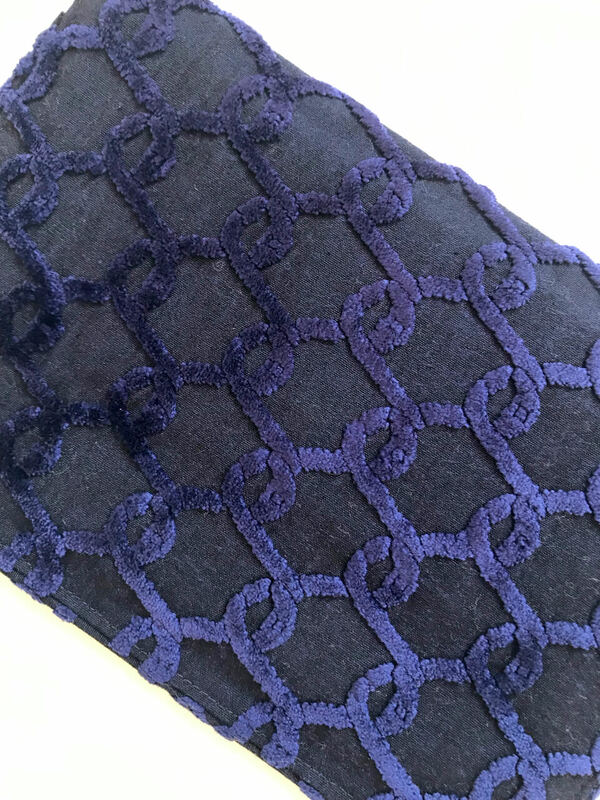 In addition to its leather, silver and crystal collections, Asprey has grown to take a premier position in the jewellery industry. 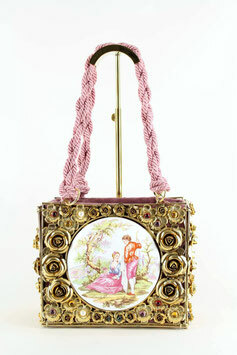 This bag is in excellent vintage condition and according to the former owner it has never been carried. Slight colour fading from storage only noticeable when open and upon close inspection (see picture 6). 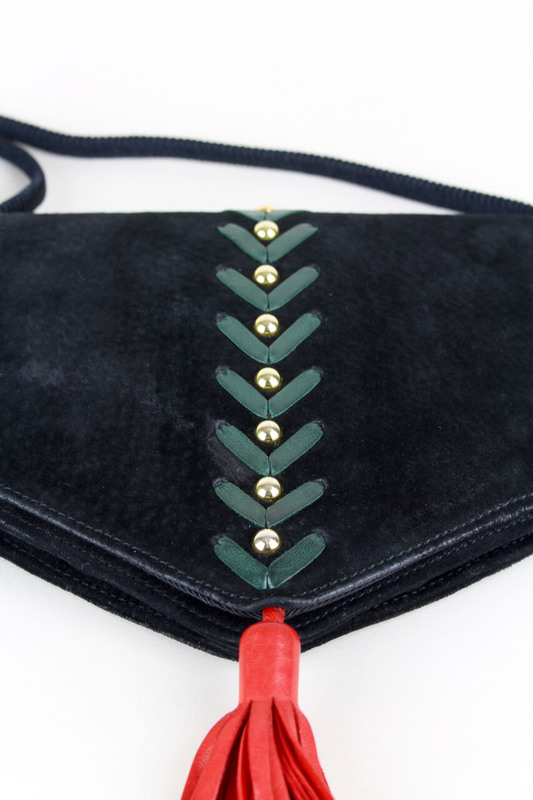 Shoulder strap's hue is a bit more intensive. 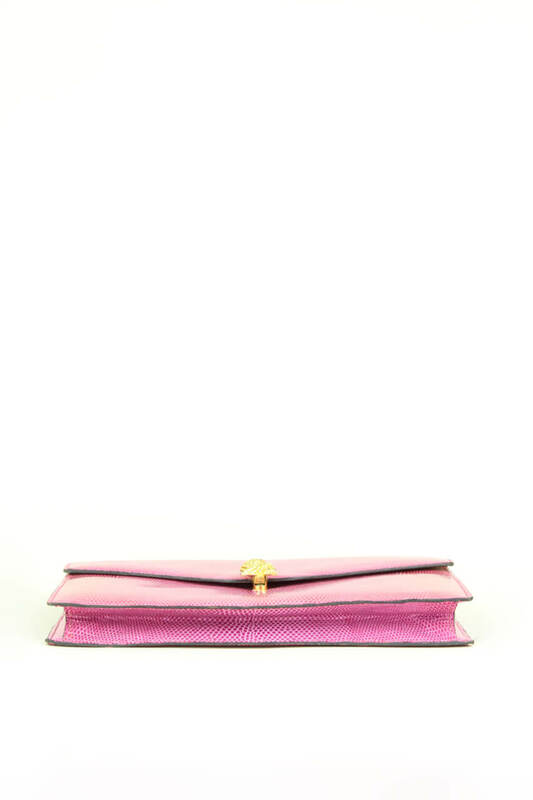 Priced accordingly but also with its rareness and exclusiveness in mind. 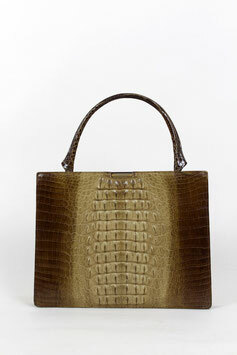 Strap length: 107 cm – 42.1"
Sophisticated hornback crocodile pattern leather handbag from the 1960s. 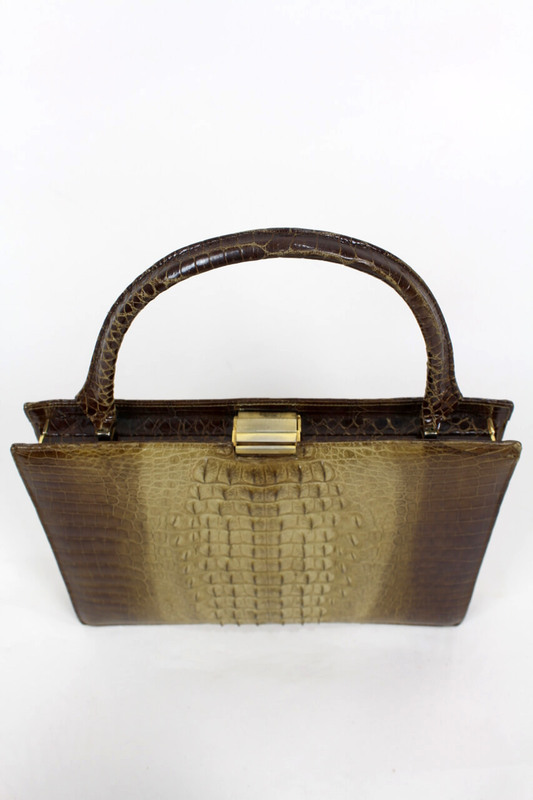 This handbag is made from crocodile pattern leather and shows a beautiful colour gradient from beige (matte hornback central panel) to brown (shiny sides) on the front whereas the shiny back is monochrome in brown. 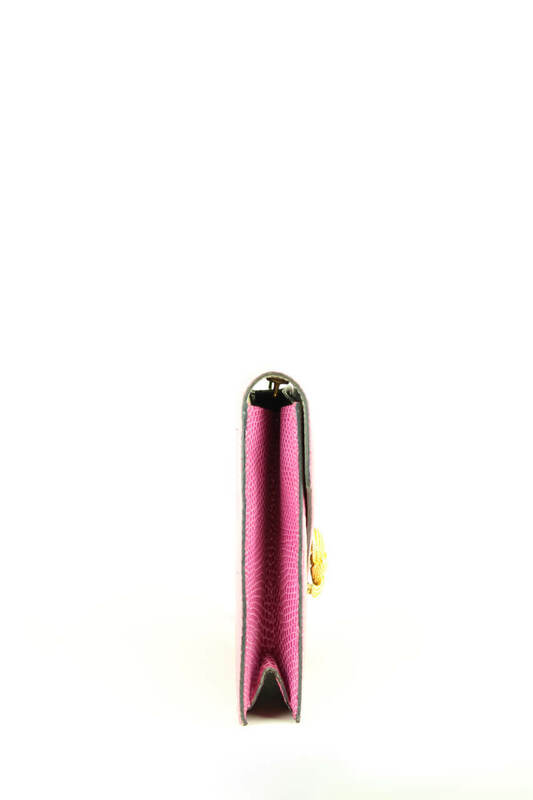 It has a rectangular shape, a gold-tone frame with top push lock closure and one rigid top handle with wing shaped ends. 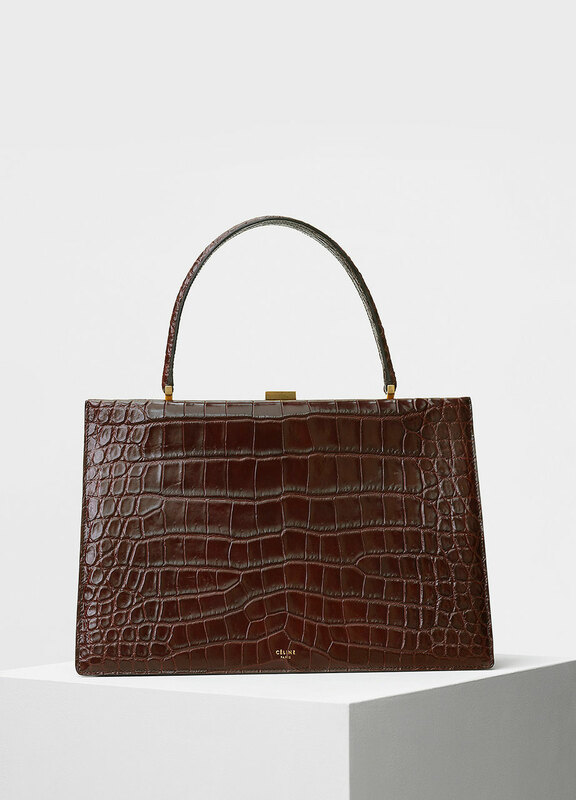 The interior has a zip pocket and a small croc-trimmed mirror pocket on the back of the bag, a croc-trimmed press stud closed pocket on the front and is lined in smooth brown leather. 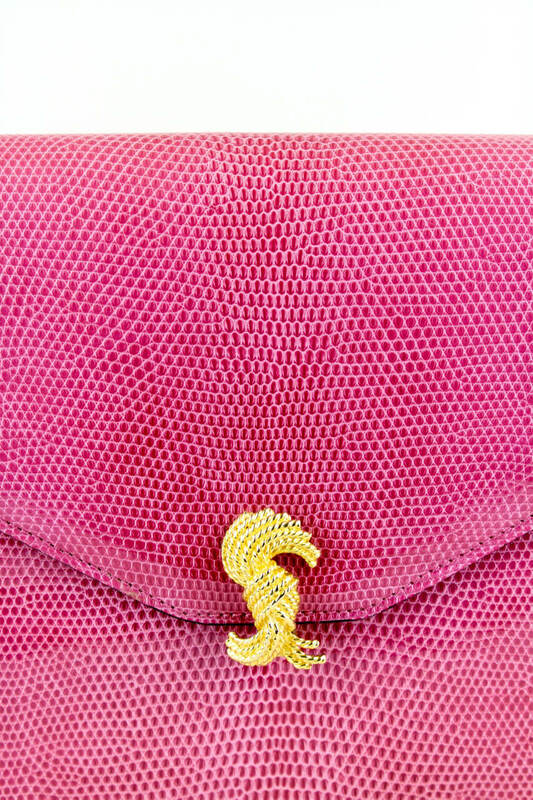 Almost a twin model is part of the Céline Summer 2017 handbag collection (see picture 7). 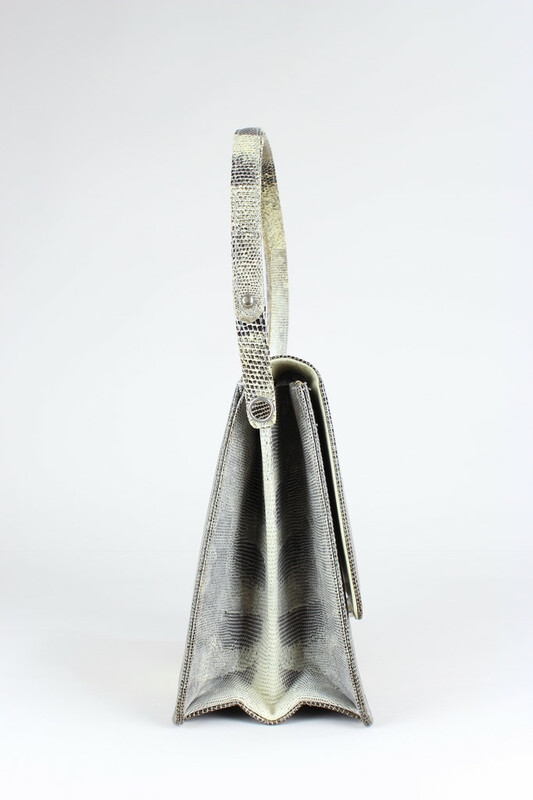 This bag is in excellent vintage condition with gentle wear to the clasp, edges, handle and lining. One thin scratch on the lower part of the back – only noticeable if you know it. 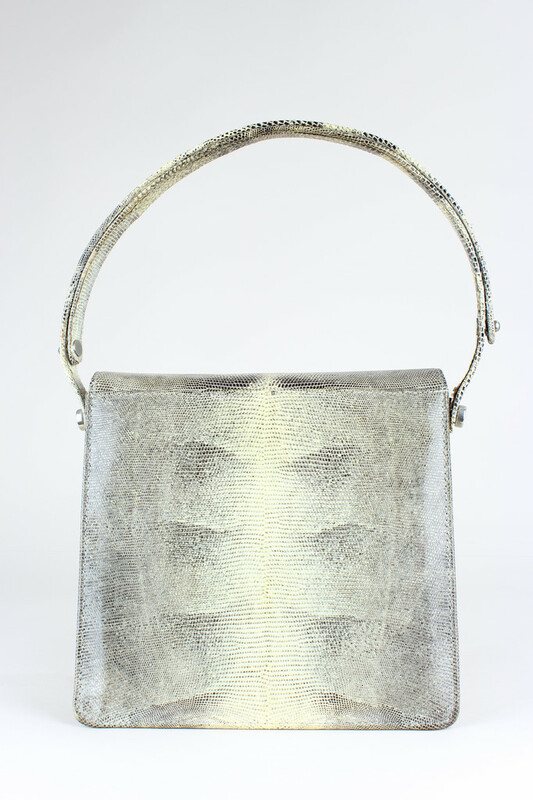 Width: 26,5 cm – 10.4"
Depth: 3,5 cm – 1.4"
Sophisticated minimalist 1960s shoulder bag. 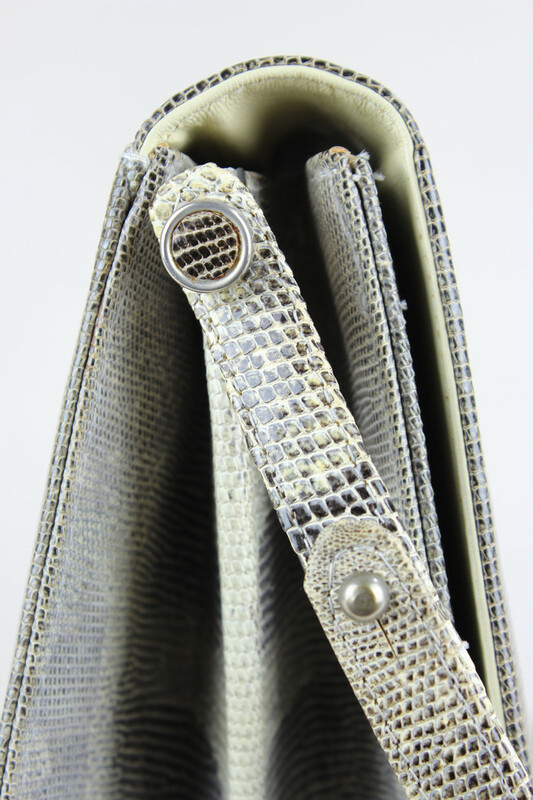 This square shoulder bag in sage and cream is made from lizard pattern leather. 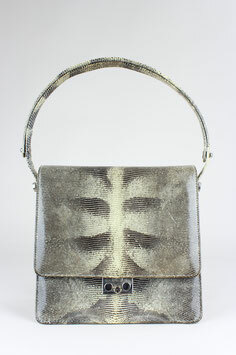 It features a fold-over front flap with a silver-toned push-lock fastening and a matching shoulder strap. 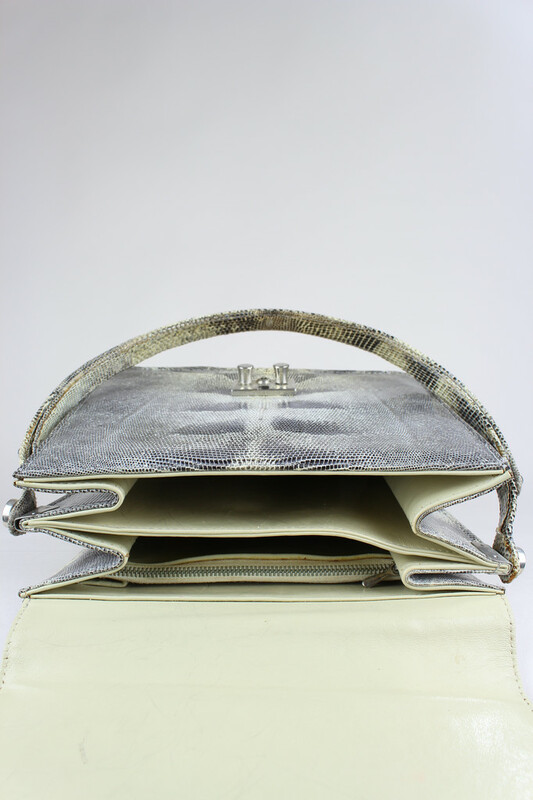 The bag is fully lined in ivory-coloured leather and has two compartments with three side pockets (one zipped). 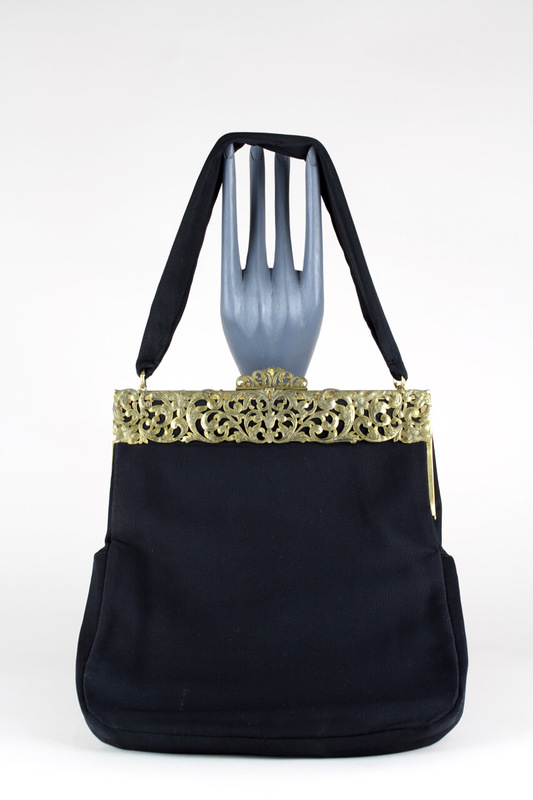 This bag is in excellent vintage condition. 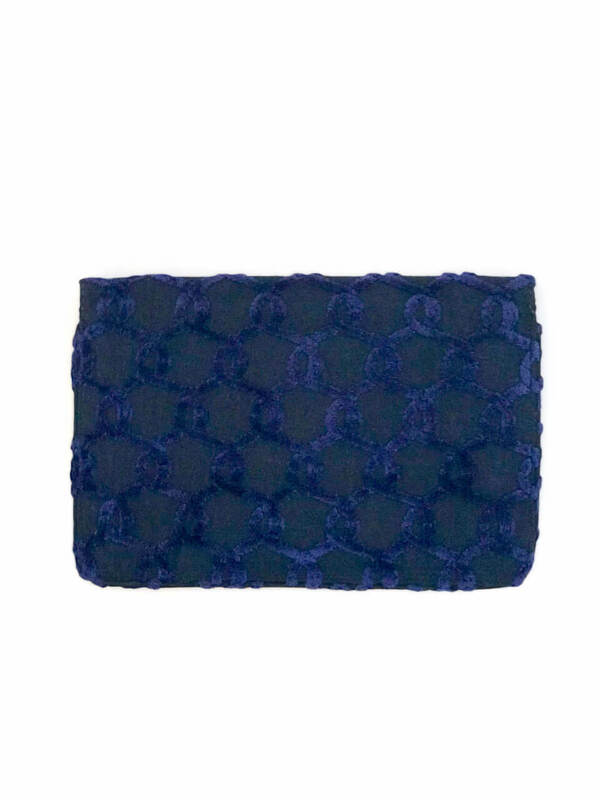 Width: 20 cm - 7.9"
Depth: 3 to 10,5 cm - 1.2" to 4.1"